There are a number of products on the market geared towards concealing. Of course, the hope of a skincare routine is that eventually there will come a day when you have nothing to conceal – no dark circles around your eyes, no rosacea, acne, post-inflammatory hyperpigmentation, or whatever. But for those of us who need a helping hand every now and then, concealer is the way to go. 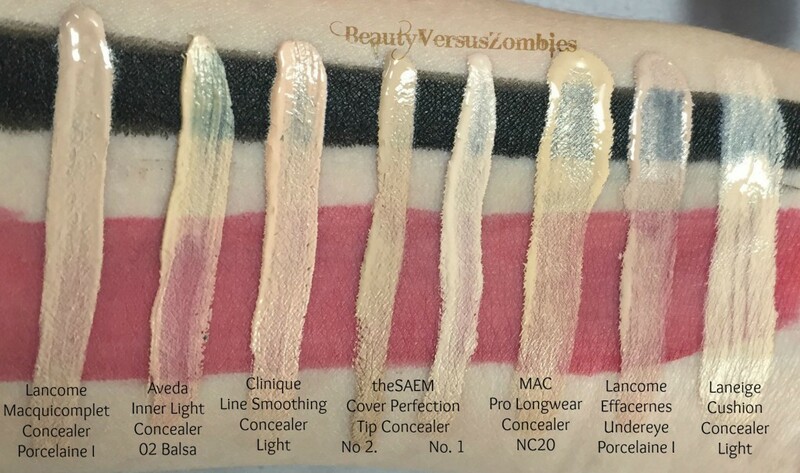 The only problem is that with so many types of concealers from so many different brands, it’s difficult to pick the type that is right for you. Stick concealers are great when you need coverage – for post-inflammatory hyperpigmentation, red spots, dark spots, or acne. They’re harder to blend than any other type of concealer, so it’s more difficult to use them in large areas like under the eyes. Another thing to keep in mind is that in areas where your skin will be moving a lot, heavier formulas are more likely to crease over time – and heavy formulas are also more likely to cake than thinner ones. One up side to these is that you don’t need a brush to use them – just blend with your fingers. 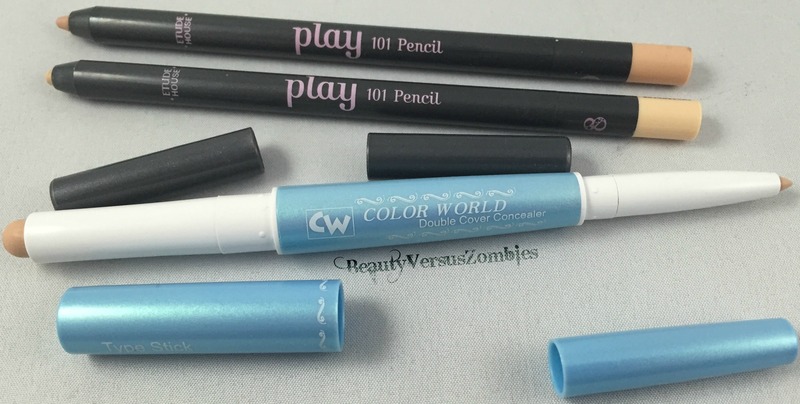 Pictured above: Two Etude House Play101 Pencils, and Color World’s Double Cover Concealer. I generally use my two pencil concealers on red spots, or to line my waterline if I am doing an eye makeup look where a natural waterline would make me look sickly or strange. 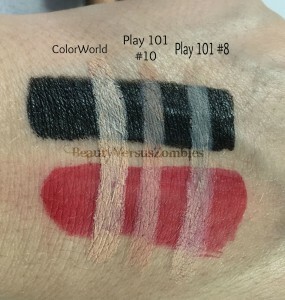 As you can see, the ColorWorld has better coverage than the Play101 pencils. It’s also a little bit softer, and therefore easier to blend, although I didn’t do any blending in this picture at all. The real up side to the Play101 is that once you put them down and let them set for about a minute, they just don’t budge. I use them when I’ve got a spot that isn’t really bad, but I’d still like a little bit of something on there. I would not use them on my undereyes. These products have the least amount of oil in them, so they last the longest. Pot and Cream concealers are, like their category suggests, right in between liquid and stick concealers. They have a high to medium coverage level and are a little easier to blend than stick concealers, but are mostly useful in places where your skin isn’t going to be moving around a lot, or if your skin is too oily to deal well with a liquid concealer. These have a little more oil then stick concealers (although some of them come in oil-free varieties), but less than liquid concealers. 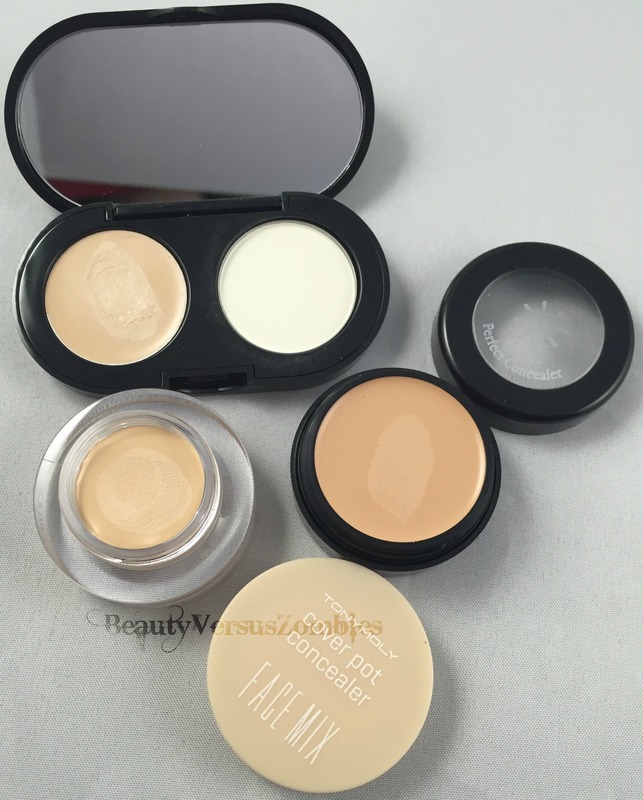 Pictured above: TonyMoly’s Face Mix Cover Pot, Missha’s The Style Perfect Concealer, and Bobbi Brown’s Creamy Concealer Kit. Cream concealers can come in a compact with a powder, or in a tub. Regardless of their container, they are a solid cream product – like a melted-down, slightly more malleable stick concealer. You’ll need an applicator – a brush or sponge – to use these products. Let’s pause a moment to talk about brushes. If you are using a cream or liquid product, there are three types of brushes you can use. The first type are brushes with synthetic “hair” – because they are made of acrylic or plastic, they’re less likely to soak up extra product than brushes made of natural hair, and they’re also more likely to be flat rather than fluffy, so they’re easier to use with creams of any type. On the other hand, if you really have a yen for using natural hair brushes, you can get away with brushes that are either a mixture of natural and synthetic, or brushes that use the hair of animals like the weasel, tree squirrel, or cat (called “tamage”). I only have a couple of cream concealers, because I really don’t like the feeling of heavy products on my face (the same can actually be said for stick concealers, which is why both of these sections are kind of lacking in the swatch department). My hand is a little darker than my face, so you can see that it’s a lot closer to the middle swatch in tone than the other two. In any case, the cream concealers require a brush, so you need to be careful not to overload the brush before you apply it otherwise you’ll end up with a giant glob of product on your face, which is probably not the look you’re going for. I personally find that the cream concealers are easier to blend, cover better, and are better to work with than the stick concealers when it comes to my undereyes (I’d rather not use a product that might tug at my undereyes, since I’m doing my best to avoid wrinkles). If I have a spot that is insanely dark, I’ll use a cream concealer on it. Of these three products, the TonyMoly was the creamiest and easiest to work with, but I also ended up with a lot of product wasted since my brush picked up so much. The Bobbi Brown was the ‘driest’ product, and the easiest to avoid overapplication with, since it was difficult to overload a brush (you just don’t pick that much up at a time). Liquid concealers are generally of a thinner, more watery consistency than any other type, which makes them great for areas that generally need both more moisture and a product that can handle a little movement – the undereyes and maybe around the corners of your nose if you’re the kind of person that scrunches their face a lot (I am). 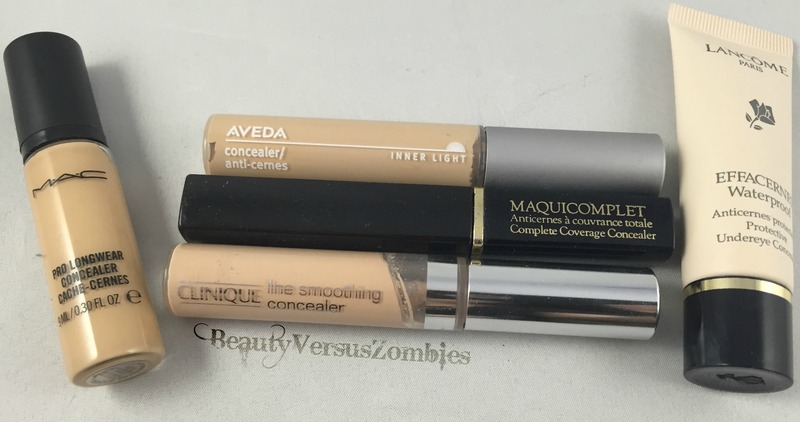 These are also the easiest concealers to blend, since they’re so watery. If you have seriously dry skin, you can consider using multiple layers of liquid concealer rather than one layer of a thicker concealer that may cake, flake, or accentuate the dryness of your skin. Liquid concealers, since they are liquid, have the most oil content of any concealer type, and the shortest wear time. Pictured above: MAC Pro Longwear Concealer, Aveda Inner Light Concealer, Lancome Maquicomplet Concealer, Clinique Line Smoothing Concealer, and Lancome Effacernes Waterproof Undereye Concealer. Liquid concealers generally come in three formats: either in a pump or squeeze bottle, in a click-pen format (be careful you don’t buy a highlighter accidentally, as they also come in this type of applicator) or in a tube with a doe-foot wand. You can use a brush to blend out these concealers, or, if you prefer, they are malleable enough to pat in with your fingers. As you can tell by the large selection of swatches, this is the type of concealer I usually use. The coverage here is mostly quite light, so if you have serious color issues you’ll need to either layer your concealer a couple times, or use a corrector (more on that later). Let’s do little mini-reviews of the products as they’re listed here, from left to right. Lancome’s Macquicomplet Concealer is pretty liquid, and easy to work with, but gives decent coverage. It’s got a doefoot applicator, so you won’t need a brush to work with this one, just your fingers. It has a really faint scent but nothing super noticeable. Aveda’s Inner Light Concealer also has a doefoot applicator. It’s a thicker product, and I occasionally end up with globs of product on the applicator when I pull it out of the tube. It has a scent, not particularly strong, but a little weird. I can’t quite put my finger on what it is. It’s almost yeasty. Clinique’s Line Smoothing Concealer has a doefoot applicator as well. It’s not as thick as the Aveda Inner Light Concealer, but I wouldn’t call it watery either. It’s kind of a nice medium. theSAEM’s Cover Perfection Tip Concealer are really small containers (only about half the size of the products listed above). They have a really light, neutral scent. They dry down a little more glowy than the Western concealers, which tend to have a matte finish, but provide good coverage. They’re on the more watery end of these products. I have shades 01 and 02. There is a 1.5, but it wasn’t available when I went to purchase these, so I just mix them as I need them. MAC’s Pro Longwear Concealer comes in a smallish pump bottle – but that bottle will last a really long time. I use this product with a brush – I pump out a little onto the back of my hand, then use the brush to put it on my face. It’s pretty liquidy, and a little of it goes a long way. Lancome’s Effacernes Waterproof Undereye Concealer comes in a squeeze tube, and is designed specifically for the undereye area. It is one of the two most liquid concealers I own. If you leave this alone for too long, it may separate a little in the bottle, and you’ll have to squish the tube around to remix it. This product has a very soft feel to it, and dries matte. Last is Laneige’s Cushion Concealer. This is a click-pen concealer with a cushion tip. It is really watery, with semi-sheer coverage. If you have really really light spots or undereye circles, and you want a barely-there product, this might be perfect for you. So, now that you have picked out the perfect concealer for you, how do you use it? You should always prime before putting any kind of makeup on – it just helps it stick on longer. There are some specific primers on the market that are geared towards assisting with concealer – Benefit’s Stay Don’t Stray comes to mind in particular – but you don’t need to buy those specifically. You don’t need a different kind of primer to work with your concealer – just use what you would normally use. “Wait!”, you might say. “Isn’t that what concealer is for?” Well, kind of, yes. But depending on how much color correction you need, you might find it worth it to use a color corrector underneath your concealer. For example, my undereyes are so dark that I could cake on concealer like there was no tomorrow, and I’d still have a dark tinge. So instead of using layers and layers of the same product, I use a color corrector and one layer of concealer to actually get the job done. If you are concealing an area that’s really red (like a zit, or a rosacea flare-up, or sunburn), you should use a green color corrector. Undereye circles and dark spots should be concealed with yellow, peach, or orange color correctors, depending on whether the dark spot is purple, somewhere in the middle, or blueish. 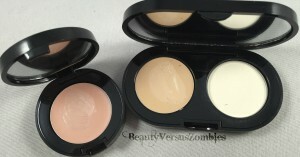 That pink pot to the left is my undereye color corrector – see how, compared to my concealer on the right, it’s not even a little like my skintone? When you apply your color corrector, keep it in a thin layer, and only apply where the actual color issue is. You don’t need extra salmon coloring on the bridge of your nose; that’s not helpful. Blend it out a little, but don’t stray too far away from the area you’re working on. You may find that you get double the benefit for one price by investing in a color-correcting primer, rather than purchasing a primer, a color corrector, and a concealer. It’s really up to you. Step Three: Actually use that concealer. Whether to apply concealer before or after foundation is a really common question, and different folks will give you different advice; all I can give you is my perspective. I conceal under my undereyes before I put on foundation; I spot conceal for red spots or acne or whatever after foundation. That way I get the color correction I need under my eyes before I put on my foundation, which tends to be very sheer anyway, and then I can conceal any spots that still bother me after my foundation is on without worrying about the concealer being smudged or obliterated by the foundation application. However, if you’re using a powder foundation, you should always conceal before – liquid products before powder products. Apply your concealer in a thin layer and blend it out. Apply to the darkest areas, then blend over into the lighter areas where you need less coverage. If you find that after waiting a minute for the concealer to dry a little the area is still a little oily, you can blot it gently with a tissue or roll a q-tip over it (with almost no pressure!) to get some of the oil off. Do not rub the product to blend it; you should be dabbing at it and patting it in. Rubbing your concealer will only aggravate any skin conditions (rosacea or acne spots) or drag on the skin (especially the delicate under-eyes). If you’re using concealer to cover raised acne, make sure you are covering all sides of the spot. If you’re using it to cover around a depressed scar (like a pock mark or a icepick scar from acne), you can put a slightly lighter color of concealer in the center to visually raise that area up. If you need to use multiple layers of concealer, wait for the first layer to dry and blot or apply a setting spray, then put the next layer on. Step Four: Set the concealer. Go forth and look fabulous! 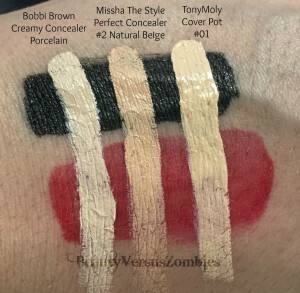 This entry was posted in Brighten/Correct, clinique, concealer, etude house, k-beauty, Lancome, Laneige, makeup, missha, play 101 pencils, SharaShara, tonymoly, undereye, Yves Saint Laurent and tagged guide, makeup by BeautyVersusZombies. Bookmark the permalink.